Bristol is the regional capital of the South West and has good intercity rail connections. 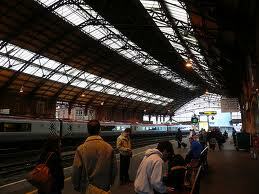 It has two major train stations, Bristol Temple Meads and Parkway. It also has eleven suburban rail stations serving Lawrence Hill, Stapleton Road, Montpelier, Redland, Clifton Down, Sea Mills, Shirehampton, Avonmouth, Bedminster, Parson Street and Filton Abbey Wood. Plan your journey and buy your train tickets through the National Rail web site. You can plan your journey to and from the train station using the journey planner on the Travelwest web site . Please note: if you are travelling on University business, you must use the University's contracted travel agent (UoB access only) to book your travel. Would you like to apply for an interest free loan to help with the purchase of a train season ticket? Please see our interest free loan section. Pay less by splitting your rail ticket. What's split ticketing? Split ticketing means purchasing two tickets for different parts of a journey, instead of the whole journey. It's often far cheaper. It is completely within the train operating companies' terms and conditions. Some other handy tips on how to save on rail fares. The 16-25 Railcard is available for anyone aged 16-25, or over 25 and in full-time study. You pay a one-off fee and it enables a 1/3 off Standard Anytime, Off-Peak, Advance, and First Class Advance rail fares. Mature students applying for the card require their application form to be signed by a University of Bristol staff member, such as their Faculty Administrator or their personal tutor, who can confirm their full-time student status. If you would like some assistance in reading train timetables please contact the University's travel team on 0117 3317259.